Portraits of artists & friends…. 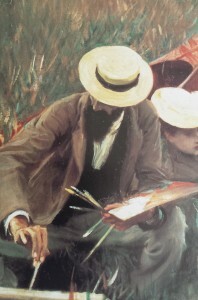 … is the title of the Singer Sargent exhibition currently showing at the National Portrait Gallery. I attended on a blustery Monday morning, amid tourists and pensioners, though the crowds weren’t too pressing. And it’s a most appropriate title. Unlike the larger exhibition at the Tate in 1998, this doesn’t attempt to cover such a long period of the artist’s life, nor such a range of pictures and styles. Instead it concentrates on the artist’s own circle and his drawings and paintings of the folk within it. It is certainly a glittering circle, covering all the arts, the stage, music and the written word as well as painting. Sargent was a man with many friends, some of whom began as patrons, others proteges. Certain names are immediately familiar – Claude Monet, Auguste Rodin, Robert Louis Stevenson, Gabriel Faure, Ellen Terry, Henry James – others less so. There are people from Sargent’s youth at the atelier of Carolus-Duran (whose portrait features) like Charles Stuart Forbes and Albert de Belleroche and those who clustered around Broadway in Worcestershire, such as the Helleus (above) and Millets. There are fellow artists from Sargent’s maturity, when he eschewed portraiture and toured Europe in search of landscapes, like the de Glehns and Ambroglio Raffele. None so reknown as himself perhaps, but fellow professionals for whom Sargent seems to have had respect as well as affection. The study of Raffele, conning the mountainous horizon in the Simplon Pass for a subject to paint, is full of both. There are few uniforms of any kind in these protraits, the princes and generals are absent, as are many of the ‘society’ portraits done after he moved to Whistler’s old studio in Tite Street in 1886. Asher Wertheimer and W. Graham Robertson are almost the only representatives of that prodigious period of painting aristocrats and the newly wealthy, although what stunning representatives these are. Wertheimer, a prominent Bond Street art dealer and entrepreneur, is shown as roguish and shrewd, holding a half-smoked cigar, with his hand hooked into his trouser pocket. 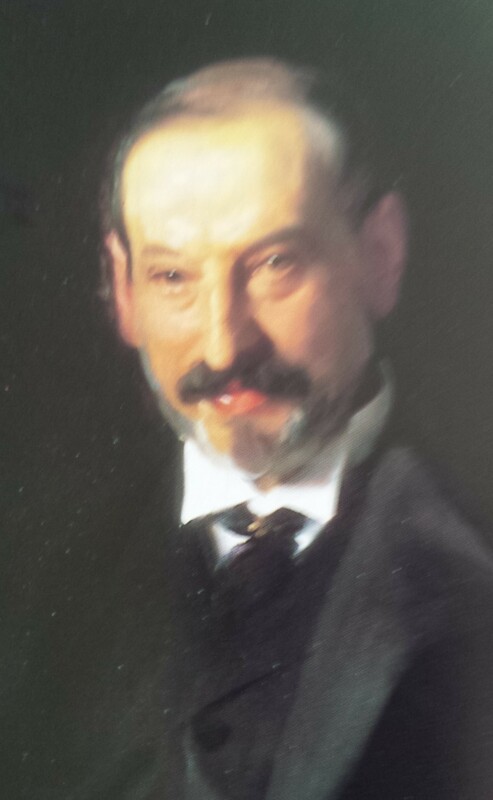 His Jewishness isn’t ignored, but he is painted as he is, successful and unique ( Sargent seems to have been immune to the anti-Semitic prejudice found across Europe at the time ). The pale and etiolated figure of Robertson, a slender aesthete wrapped in a great coat that looks too large for him, captures the fin-de-siecle spirit of the 1890s. His eyes are slightly puffy and red, his mouth pinched and rosy against his white skin. This is a ‘beautiful boy’ indeed, although aged 28 at the time. There are a group of the American pictures, done in Boston and New York, especially the portraits of the Players Club, great American actors of their day. But the remarkable war pictures are absent as are the murals. The highlights for me are the two aforementioned portraits, the stunning study of the rehearsal of the Pasdeloup Orchestra at the Cirque d’Hiver, which is all motion and sound ( it makes me believe I can hear the tuning up ) and two portraits of Louis Stevenson which I had not seen before. In the first the novelist is, seemingly, caught striding back and forth, in full flow. In the second he is seated in a wicker chair, but still radiates energy and hyper-activity. Did he rise from the chair to do the pacing, or has he flung himself into the chair at the end of his panegyric? 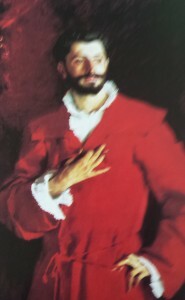 But all the portraits are exceptional, even, perhaps especially, Dr Pozzi, painted as a mixture between a cardinal and a grand inquisitor and as if set upon the stage. The diabolic good looks and many love affairs of the leading gynaecologist scandalised and titillated Parisian society, never more so than when he founded ‘The League of the Rose’ a society dedicated to the confession and acting out of sexual experiences. An overheard remark from a very elegant lady at the exhibition could have come straight from a nineteenth century haute bourgeois Parisienne. ‘He’s very handsome, but I wouldn’t want him poking round in my bits.’ Is this Sargent being ironic, as well as playful, perhaps? The exhibition runs until 25th May, catch it if you can, it is well worth a visit. Tickets are £14.50 or £13.00 for concessions, and all tickets are for timed entry ( though when we visited there was no limit on the amount of time spent in the exhibition ). Please note, the images attaching to this post are taken from published photographs and in no way do justice to the actual works.